In second grade, I got a pencil stuck in the palm of my hand for about an hour, and that is the last time I remember being as popular as I have been in the past month. Overnight, one of my blog posts started making the rounds on Pinterest, and BLAM-O, I had a bunch of new followers. Welcome, new friends! What are your names? Where are you from originally? Tell me two truths and a lie (or just a bunch of lies, if you want. I'm not going to fact-check.). But a few months after I got married, everyone started getting Pinterest accounts (this was around the same time that mason jars started being utilized for things other than pickling) and that's where most of my regrets stem from. None of these are things that keep me awake at night, but if I can help anyone feel more confident about their creative choices on their wedding day, that sounds pretty great to me. Do-over #8 (I left off at #7 on the first post): I would have shopped around for wedding dresses. Is this not the exact reaction you hope to hear from your mother? This exasperated mom is definitely not a fan of this perfectly lovely strapless dress worn by her disappointment of a daughter, Kelly. By the way, be sure to watch the above video roughly 145 times in a row, if possible. Each time you do, you will gain a new appreciation for the disdain with which the mom says KELLY. Also note Kelly's laugh as she puts her hands on her hips. She could not care less. But anyway, for as much as Say Yes To The Dress should have prepared me for this sacred moment in a woman's life, I still don't think I did it right. I took two of my bridesmaids, my sister (also a bridesmaid), and my mom to a giant store in Austin. We waded through the sample dresses like we were walking through a magical forest and picked out the ones that we could discern as acceptable. In the midst of all of this, a sales associate selected a couple herself and then she ushered me to a dressing room. I wasn't wearing any of the right underthings, so she basically got an eye-full of all my best bits and pieces. I kept apologizing, and she kept saying wonderful cliches like, "You've got nothing I haven't seen before." I tried on a few, and every time I tried on one of my friend's picks, they were like YES, YES THIS IS THE ONE. And I was like...meerrrr...maybeeeeee. But then the sales associate brought in a new dress (which I suspect she had been keeping from me all along for dramatic effect). I tried it on, and I kind of had that moment of...Oh hey, that's my body in a wedding dress...and it looks really good...I could wear this on my wedding day...hey...I'm getting married...to a man...a man I love! Look at meeee!! I walked it out to the rest of my group, and while no one began convulsing or anything, everyone was in agreement that I looked awesome. In total, I tried on maybe 5 dresses. Now, this is totally a personal preference, but I really wish I hadn't made my decision that day. 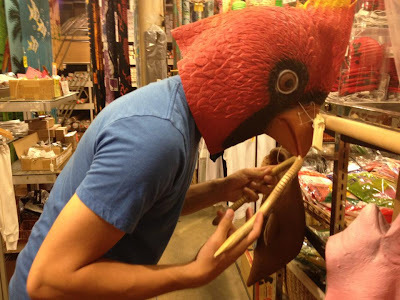 It was my first experience shopping, and I was so overwhelmed by it all. Not only do I wish that I had shopped somewhere else in addition to that place, but I also wish I had tried a different kind of store altogether -- a small boutique or some place more modern. I might have landed on the exact same dress, but I would have felt a peace-of-mind knowing that I couldn't get that dress out of my head. And, by the way, I love the women I shopped with. They were perfect on this day. Not too pushy, very good listeners. But I wish I could have just gone with my mom. She's seen Say Yes To The Dress too, and that day, she was doing everything she could not to be an overly opinionated you-gotta-be-kidding-me-kelly kind of mom. She was basically an angel, but in that, I didn't get to have a quiet moment with her to really reflect on the tradition and meaning of the whole event. I'm into that kind of thing though. If you're not, you do you. 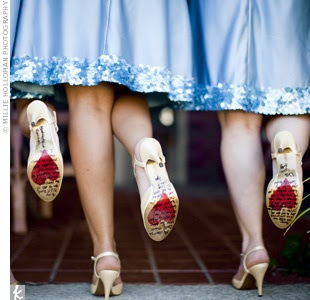 Do-Over #9: I would ask my friends to be my bridesmaids in some deliberate way. I like a lot of what it is happening in the above picture save for the word "maid". 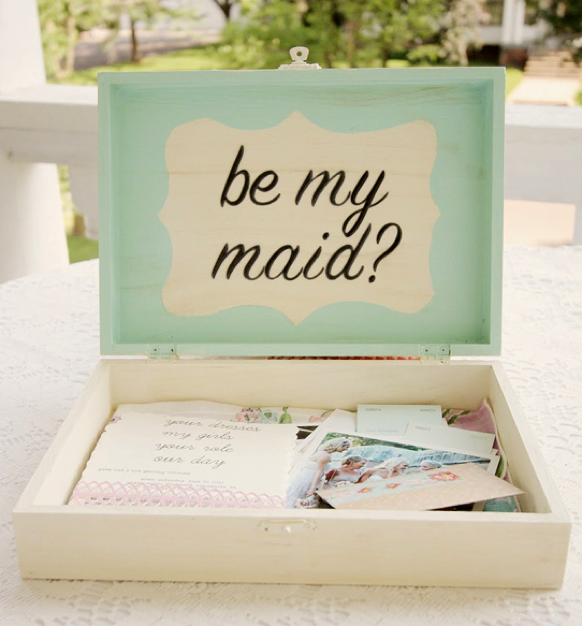 To me, that word is synonymous with "housekeeper" which is a fine profession, but you don't really need to paint a box to ask someone to be your housekeeper. 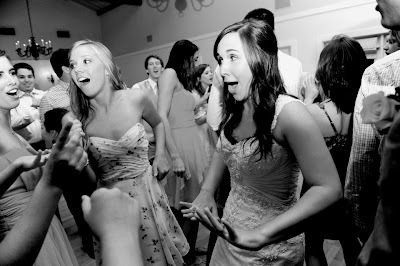 If you want to ask someone to be in your wedding, say "bridesmaid" so that it doesn't feel all Downton Abbey up in here. But anyway, that's beside the point. Making a cute little box with little remembrances and letters to ask your friend to be a bridesmaid -- that is the way to go. The way I did it is not necessarily wrong. Basically, I just straight up asked them. Some, I asked over coffee. Others, I conveniently asked in the midst of a great conversation wherein I was thinking about how much I loved them. 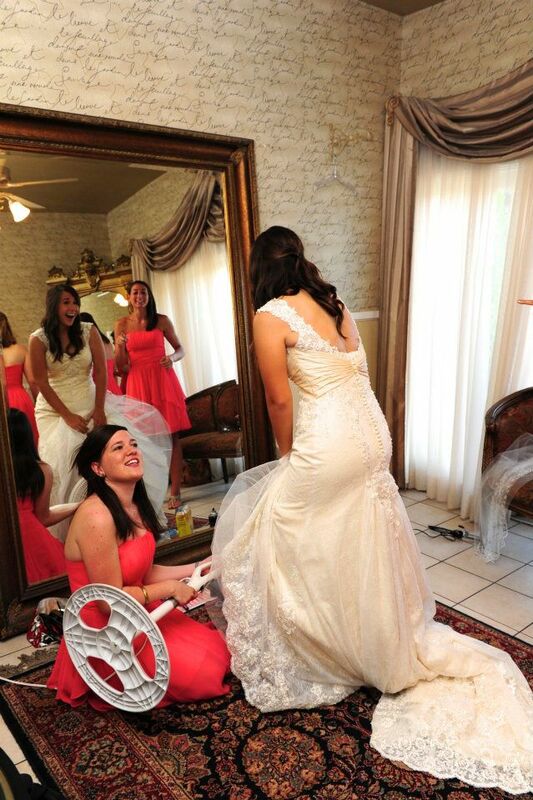 This happened with my friend Kaley who I asked to be my maid of honor while standing in a bathroom. She mentioned this during her speech at my wedding, which probably should have made me slightly embarrassed, but I had lost all self-awareness at that point. This is pretty much how I felt the entire time at my wedding: deliriously happy knowing that I looked good and everyone loved me. The women who you ask to be in your wedding party are unique creatures in your life. They have been in the trenches with you. They love and support your relationship with your husband. They know you. They have literally watched as boogers fall out of your nose and into your mouth as you are crying. These women deserve to be shown some serious love before and during your wedding. ...I love you in that I think you are probably an incredibly thoughtful person who I would love to spend some quality time with. I am frustrated with you because almost nothing in this world has made me want a time machine more than the above picture. Why. Did. I. NOT. Do. This?! 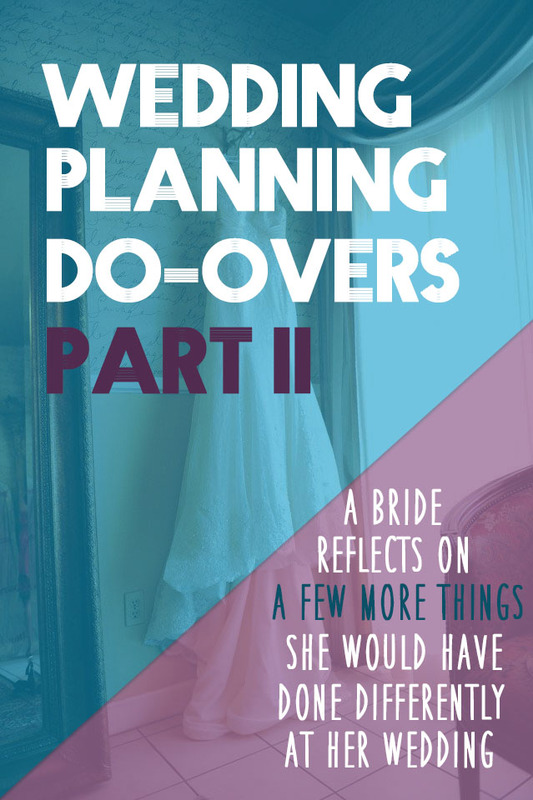 Do-Over #10: I would wait a day to leave for my honeymoon. We woke up at 5:30 AM the day after our wedding to catch a plane to Playa Mujeres, Mexico. Waking up at 5:30 AM the day after your wedding feels like waking up in the midst of the zombie apocalypse. You will not be able to recognize any person around you, not even your new husband, as someone who loves you and does not want to eat your brains. Everyone is the enemy at 5:30 AM the day after your wedding. There is really no reason that you should know what the world looks like at that time ever, especially the day after your wedding. Just sleep in, stay in bed all day, count each other's fingers and toes (or whatever it is you do alone as a married couple), and leave the next day at 10 AM. 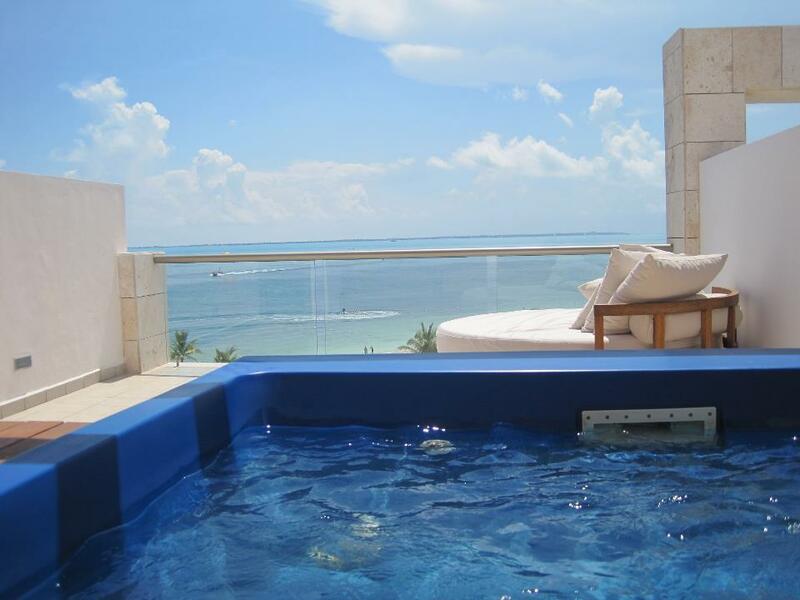 Stay in Playa Mujeres for as long as you can, and while you are there, consider never leaving. 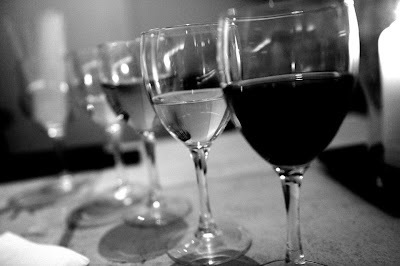 Do-Over #11: I would skip out on the unity candle. If you get to a part of your wedding ceremony where you think to yourself why am even I doing this? chances are, you shouldn't be doing it (I am hoping that in your case you are not asking this question about getting married in general). We had that moment when lighting our unity candle. Everything up until that point had been all about gracefully holding hands, looking longingly into each other's eyes, and feeling like every moment had incredible meaning. I could have done this all day. When it came time to light the unity candle, we were kind of like, oh wait, we have to do something now? Our flow was just totally interrupted. We waddled over to the little table, fumbled with the candle sticks, said aloud, "Are we doing this right? ", lit the big candle, narrowly missed setting my dress on fire, sweated a little bit, and then waddled on back to our spot in front of our pastor. It felt absolutely pointless. 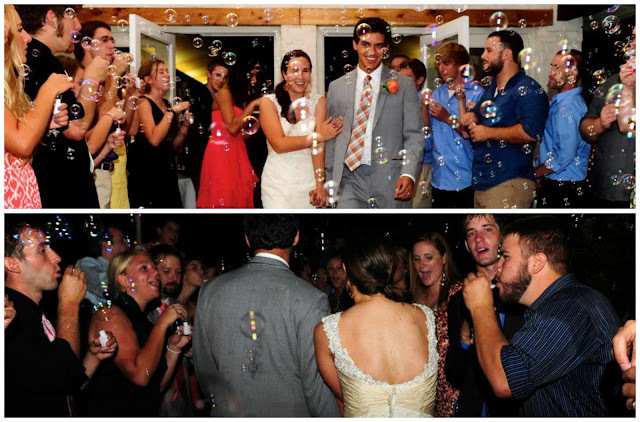 My point is this: Wedding traditions are great, but feel free to skip out on the ones that are just not right for you. 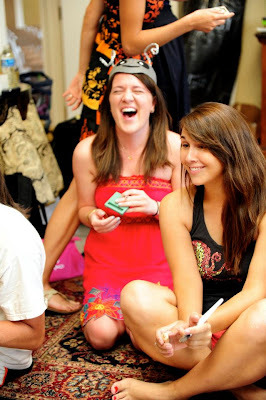 Even when we were planning our ceremony, I was not on Team Unity Candle. Nothing against anyone who has done it for their wedding. Several of my friends went the unity candle route, and they loved the symbolism. But it just wasn't for us. 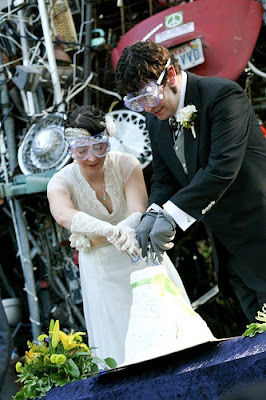 ...do what this couple did and have a Unity VOLCANO! Or just don't do anything at all. Cross my heart, no one will notice and if someone does say something to you about it, feel free to have some body-builder cousin remove them from the wedding. Do-Over #12: I would hug my mom and dad before getting in the getaway car. This is probably a no-brainer to you because you are not a heartless monster like me, but y'all, hug your parents before you leave your wedding. As soon as we drove off, I realized immediately that I had not done so and I almost made Daniel drive back. How can you remember your own name in this mass of insanity, let alone, remember the fact that you have parents who changed your diapers and sent you to college? Regardless, find them and hug them. Assuming you have good parents, they are worth honoring in this way. Also, parents, make yourselves findable and huggable! I'm not sure my mom and dad were even around in this mess of people, so had I remembered, I would have had to wait for them to push through the mob scene. P.S. While we are on the subject of getaways, I would also change into a comfortable exit dress. Before my wedding, the thought didn't even cross my mind. This is the most expensive thing I've ever worn! I am keeping it on until it disintegrates. But by the end of the night, that dress was basically just a huge sweaty curtain clinging to my body. To me, there are only two options: change your dress or be less of a sweaty person. I had a fiesta-themed wedding and no piñata! Again, this will not be the death of me, but how cool would it have been to smash a piñata while wearing a wedding dress?! Answer: So damn cool. Man, this bride just gets it. You can also use the piñata as a substitute for cutting the cake together, which as I'm sure you can imagine, feels plain weird. Why is it that I have been cutting cakes just fine on my own my entire life, and now that I'm married, suddenly I'm too weak to do it by myself? It just doesn't seem right. 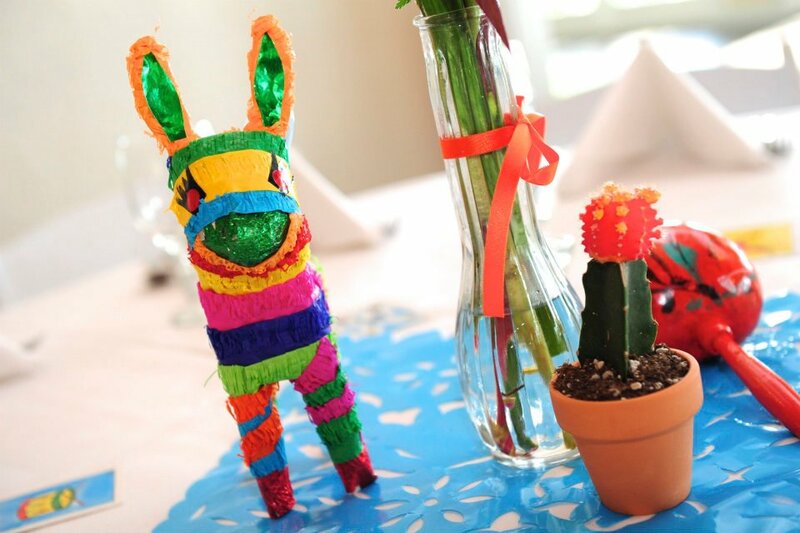 Anyway, the silver lining is that we had little piñatitas on the tables. They were kind of the cutest thing I've ever seen. Another fiesta-related detail we missed...we didn't have a mariachi band! Okay, cool it, Julia Roberts. A mariachi band would have been great, but again, it's not the worst thing in the world. 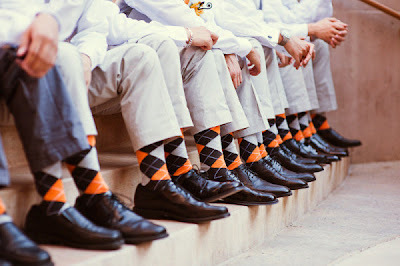 We bought the socks, handed them out to the groomsmen to their giddy surprise. We also bought a fancy sombrero with which to take quirky fiesta pictures with. Then, the day of, no one told the photographer about any of this stuff. 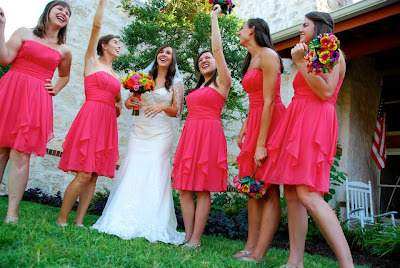 And by the way, we had the best photographer, I think, ever (Lauren Guy Photography...Texas wedding or event? Check her out). But even the best photographers in the world aren't mind-readers. How was she supposed to know these guys were wearing matching socks or that I had secret dreams of wearing a sombrero with a wedding dress? If you have specific requests like this, tell your photographer. They would be happy to hear it. Again, silver lining, all of my pictures were better than I could have ever planned for them to be. Your photographer always knows better. *Here's the thing about this do-over that made me hesitate to even write it -- Try as you might, you are going to miss some details. Two weeks from your wedding, you are going to realize that one thing that was so blatantly obvious that you can't believe you missed it. But who cares? You're married. My heart breaks for the woman who plans so feverishly for this one amazing day that she hardly has a moment to contemplate how different everything is going to be for the days that follow. Marriage is this beautiful, powerfully confusing, sometimes nauseating, complex covenant that has an effect on us in profound ways that we are all woefully unprepared for. It is something with gravity. It is something worth your meditation. It is something precious, but it is also something hard. If you miss every single detail of your wedding, but you honor your marriage for the rest of your life, I say, best wedding ever. If I think of anymore Do-Overs, you'll be the first to know. I hope that in some way my experiences have been able to help give you a peace of mind for your special day. Trust me. You're going to be fine. Just don't trip, and if you do trip, turn it into some kind of artful tumble, if you can. 1. 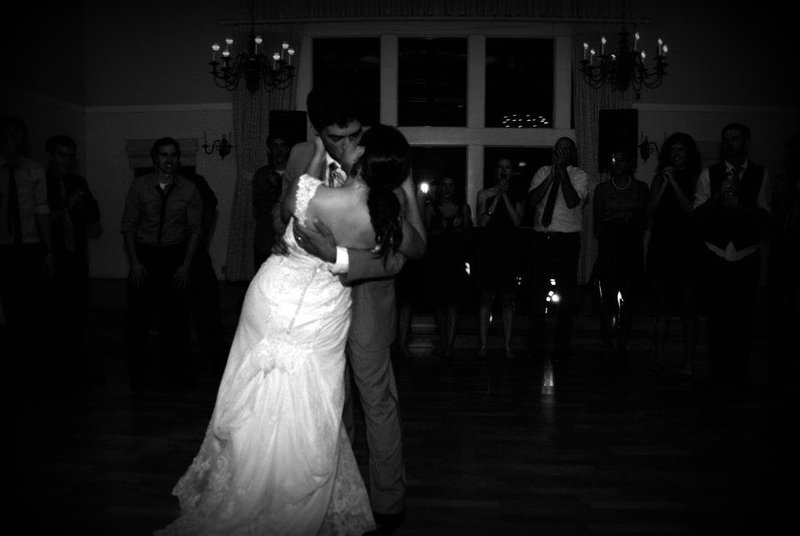 I would skip the receiving line and just dance with everyone instead. And I would be sure to make this fabulous face as often as possible. 2. I would serve alcohol...because dancing. 3. 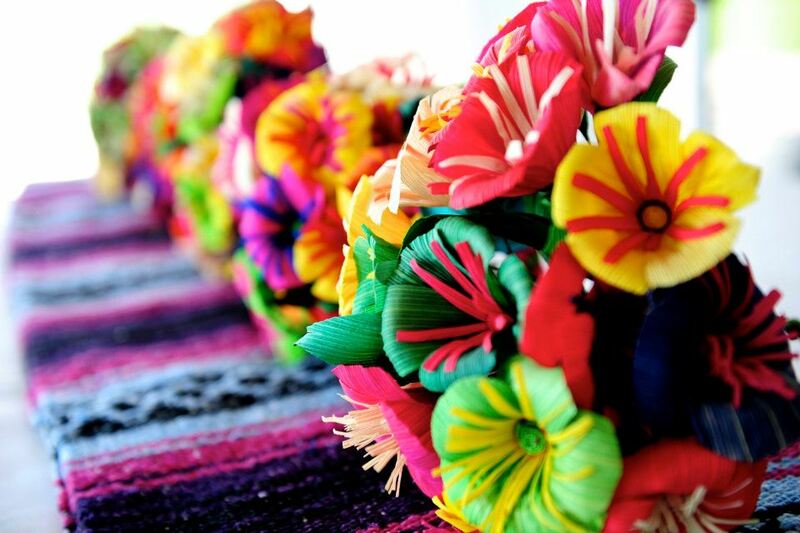 I would use cornhusk flowers for my bridesmaids bouquets because they are on-theme and super cost-effective. 4. I would relish in public displays of affection. 5. I would request that my maid of honor wear the following hat while we get ready. 6. I would blow this fan up my dress because Texas is hot, y'all. 7. I would write my husband a letter for him to read while he's getting ready. 8. And speaking of my husband, my Lord, I would marry that guy all over again and again and again. Please be sure to pin this on Pinterest so that other brides can learn from my mishaps! Also, if you're liking this advice and the baby GIFs, feel free to follow Avoiding Atrophy (you can do so on the right-hand side of this page). Thanks for being here today, and special points to anyone who actually made it through every word of this thing. Looking for more of my wedding wisdom and tips? Check out Avoiding Atrophy's wedding section! Thanks for reading! I've mastered that face over several years. I found you trough Pinterest!!! And I love your blog!! 1. I love my Husband and my kids. I have two wonderful boys, 3 and 1 year old. 2. I'd love to be a stay at home Mom. It's not that I hate my job, but as you can see on my truth number 1, I'd love to stay with my kids all day long. And I totally agree with You on number 10. The same thing happen to my husband and I on our wedding. Hola Karen! So glad you like the blog. Yay for being a devoted wife and mother! That's awesome. Keep your chin about up the job situation, but I totally get it. Maybe you could find some way to make money from home? Um yeah I read every word of this things because you are my new favorite blogger. You are a super funny good writer. And if you really do want to know, my name is Amanda, I am from southern California and I just got married less than two weeks ago! Thanks, Amanda! That is seriously high praise. Congrats on getting married and whoa, Africa?! That's awesome. Enjoy having adventures with your husband! Oh man, I totally agree with you on #8. I think I tried on maybe 3 wedding dresses and I completely regret not going to other stores. Anyway, I just wanted to say I really enjoy your blog. You're a really great writer! I can also relate to you on the whole "getting married young" thing too. 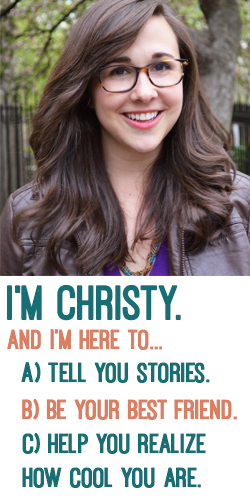 It's also really refreshing to find other Christian bloggers out there so keep up the good work! Glad to be able to relate, Ashley! Thanks so much for the wonderful compliments. 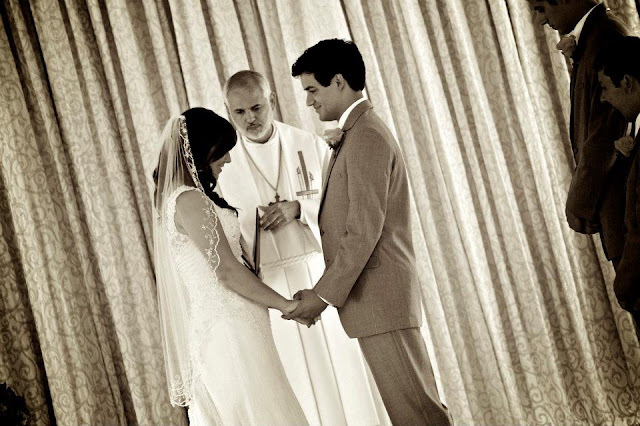 Blessings on your marriage! you are hilarious! this was so fun to read, so thank you! and your wedding was adorable! Thanks! I'm so glad people enjoy the look of my wedding. That makes the hours spent shopping for tiny pinatas somehow seem worth it. My first comment was OMG she's from Helotes!!! I grew up about 2 miles away and spent many days listening to country music and hanging out at Floores :-) My first fleeting thought of death was as i was riding the zipper at cornyval...im happy i didnt die or vommit. :-P Hooray! Anywayyyy....awesome ideas and love the blog! The zipper, yes! My favorite was the gravitron. Glad to hear from someone else from Helotes! I totally enjoyed your blog and i love all your wedding planning ideas! I'm definitely taking note of everything written here, just got engaged and feeling all overwhelmed about the whole thing. Hopefully i would be able to pull the whole wedding planning thing off and stay stressed free until the big day! Cheers to you and your husband! You're going to be great! Congratulations and thanks for the support. Wow, it makes me so glad to be able to help! And I'm sure you will not regret your wedding dress. No worries. Congratulations and thanks for reading! I came here by reading the first part of your wedding planning do-overs. I have read this one also and I must say that you have some unique wedding planning tips. And I think that this part is the better and interesting one than the part one of it. First off, you are just hilarious!! "If you miss every single detail of your wedding, but you honor your marriage for the rest of your life, I say, best wedding ever." Couldn't be more true! I keep trying to remind myself that it's just one day! Kudos to you, and thanks! 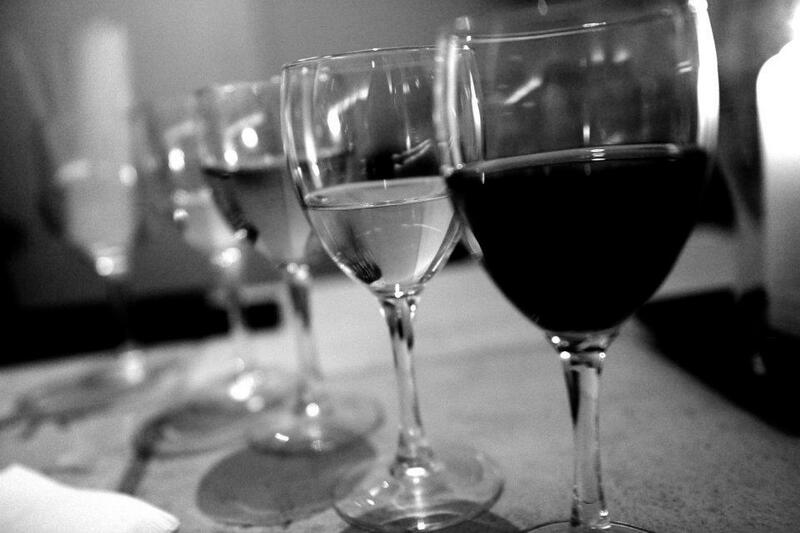 Please let me know about the new york venues for having a great party. I am searching for a long time but didn't find right venue yet. Love this! Thank you for sharing this! Brides to be can learn from this! Found you through Pinterest - LOVE YOU! :) Looks like you had an amazing wedding, and I love all of your tips. Super cute blog...and you are just adorable! I laughed and laughed. Love how "In Love" you and your hubby are. It's so nice to see. :) I got engaged just over a year ago and we don't have a date yet, because we are in the process of buying a home. However, there are so many ideas on Pinterest that it's almost overwhelming...but it is great. 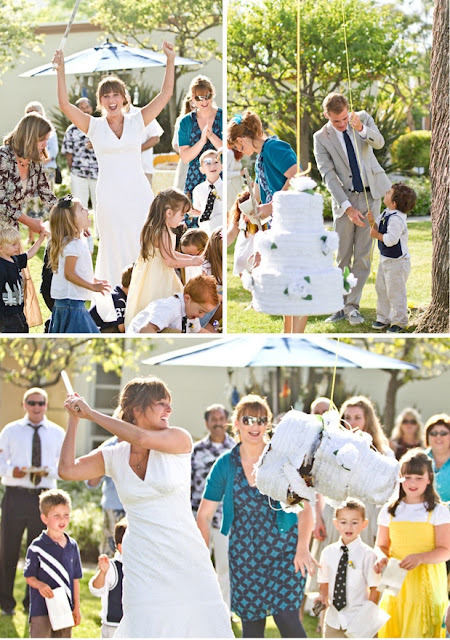 Thank you for the great tips...definitely going to get someone to Video the wedding and also a piñata for the fun of it, my fiance actually suggested that all on his own...bless him. Anyways...your wedding looked like a blast and thank you for sharing. Thank you!!! This has really helped me think of a few things as "non-negotiable". Oh please please please please please do more of these! I'm not getting married any time soon, heck I'm not even engaged but I don't care! These are awesome, informative and funny to boot. Keep 'em coming! oh my word! you are HILARIOUS! i'm single--marriage is a long way off. but my goodness, reading this is SO entertaining! keep 'em coming. Thank god I found this! :) we are starting to plan our wedding, two years in advance I must add so we don't forget anything! And your post made me laugh, and was a huge help!! Thank you so much again!! I read every word......this was awesome to read & I thank you. The tips, the tricks, the smiles & the laughs out loud -----> this is a bookmarked site to come to multiple times before my own big day. This was amazing! I am two months away from my wedding, and I have all these pins about what to do and not do at your wedding. I've probably read at least 30 so far - yours is the only one I've taken notes on! You have a beautiful gift of words and I loved every minute of it (well, both actually!). Thank you! Man, you are hysterical and very helpful! My wedding is 3 months away and I will definitely be taking your advice to heart. Thank you! I'm thrilled... I'm getting married on Saturday and your list almost completely follows things we are or aren't doing! Whew! I feel much better having read these, thanks to one of my more level-headed bridesmaids who sent it to me. Can't avoid the 'leaving first thing the next morning for the honeymoon' thing at this point, and we both just had the shock of what time we'll have to get up the next morning, but it will certainly be an adventure! My best friend and I have been friends since I was 5 and even though I would love to say that was yesterday I am now 31 and we are still stuck like glue! She is getting married in a little less than a year, and as it gets closer I'm a little afraid of her turning into a crazed monster, so I'm sending her your blog and will probably print this out so when she starts turning into someone she is not you can be her snickers bar!! I enjoyed this so much!! I wanna know about the New York venues for rejoicing my wedding at one of them. Cheers for the couple. If you forget to hug your parents, do stop and turn around or call them or something! It happened to this MOB and its the worst. Trust me. We both hated it and regret it. I think I love you. By that I mean that you are incredibly witty and fantastically charismatic and I will follow your blog for the rest of forever. I'm Alaysia (pronounced like Malaysia, without the "m" obviously) I'm about to be 23 and I'm dating the man I seriously hope to marry! I'm a wedding planner and find your advice extremely insightful! Okay so the last part is only a partial lie (the only wedding I've planned is the one I hope I get sometime in the near future) but I really do love these tips and can't wait to utilize them myself one day! I just wanted to say a quick thank you for making me laugh hysterically on my lunch break. I got married last year and I would swear you were talking about us in more than one of your topics. You're writing is descriptive, witty and comes alive off the page - kudos! I am glad to go through your post. Hi! My name is Claudia! 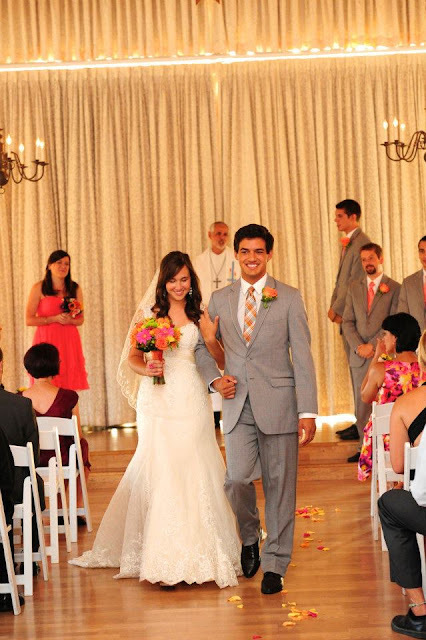 I absolutely loved your blogs about wedding do overs! I'm from friendswood tx, exactly between Houston and Galveston. my boyfriend just popped the question last week and this was SO helpful! you sound like someone I could easily be friends with! I hate to be a bother, but I happen to know the girl who did the "be my maid" boxes, and she didn't receive proper attribution here. She is a really sweet person and, given how viral that image is, she doesn't get nearly enough credit. Would you mind adjusting the "via" link to http://www.rinserepeatblog.com/ or http://www.rinserepeatblog.com/2011/07/askin-my-maids.html? Hi Emma, thanks so much for this! I have changed the referring link. I definitely want to give her the credit she deserves, so thanks for calling this to my attention. Oh, and I knew not to go cheap on the photographer. But we got way too many pictures of family and not enough unique shots of us. So...we're getting married again. Our way. Vow renewal, elopement style. Really this is a day for you and your spouse, nobody else matters. nobody. Hello! I really enjoyed your post! Such great information & tips that I had to write a few down. I'm getting married in September and absolutely love Pinterest! Thank you for the awesome advice. Look forward to reading more posts soon. Sweet baby Jesus. This list is amazing. Great advice aside, you had me dying of laugher so many times!! The pug gif. I just... oh man! Perfect.